INTRODUCTION: "A village burned. A boy taken into slavery. A lost treasure of a fallen empire. So begins the tale of Macsen, a farmers son, an orphan, taken from the ruins of his home to a distant land, made a slave and sent to die in the arena. But he escapes, falling into a life of adventure across a world where lands float in the endless skies, whose beating heart is a mighty Storm ten thousand miles wide. Adrift and alone, with only his will to sustain him, Macsen swears vengeance against those who shattered his life, to seize his destiny and shape it with his own hands. He becomes a warrior, a pirate, a captain, leading his fearless crew to fortune and glory in war-torn skies, blazing a path of courage, of vengeance...and ultimately of salvation." I found out about this book from a review inquiry for FBC - we get quite a few such and I check each to see if its subject is of interest to me and then if so, I check an excerpt to see if I like the style since those are the two main determinants of how I choose what to read. In this case the blurb above intrigued me a lot and when the excerpt linked above hooked me, I could not wait to ask for a review copy from the author and just bought a Kindle copy of the novel and read it almost without stopping. FORMAT/CLASSIFICATION: "Field of Fire" stands at about 375 pages and has two main threads. The main storyline follows Macsen dun Mocredd a young orphan from the village of Erdenec on the (mid level floating) country of Perun. Perun is a Scotland like country which is under the rule of foreign Naurites (English like) oppressors, while the local clans are still fierce, hard to subdue and are found all over the many countries of the novel's world as mercenaries. When Agil a Skywatcher - member of the guild of scientists, magicians and physicians that is respected all over the lower and mid-level of the world - comes to Erdenec to look for an artifact and finds it, trouble comes behind in the form of a dastardly magician villain that calls himself Ornezo and his slavers hirelings who sack the village with the connivance of the local lord - transforming the village into sheep grazing pasture is more profitable than taxing it - and take the few survivors including Macsen to sell in a city state of the Low Lands. In a separate thread, we follow Zofera, a Skywatcher of the lowest rank and junior to powerful Erbul who is the local Skywatcher boss in Vorsenn, the capital of Audrun - a France like analog - which is the most powerful state of the mid-level and main rival of the Naurites. There is a new and unexpected young king in Audrun after plague took his father and older brothers, a queen from a rich but less pedigreed city-state and the grandma dowager Queen who does not like rivals, all making for quite a combustible mix. "Field of Fire" is fantasy adventure as it should be done; the first installment of the Storm at the Center of the World series it stops at a reasonable point in the tale with a promised sequel for later in the year, sequel that I will get and read asap. 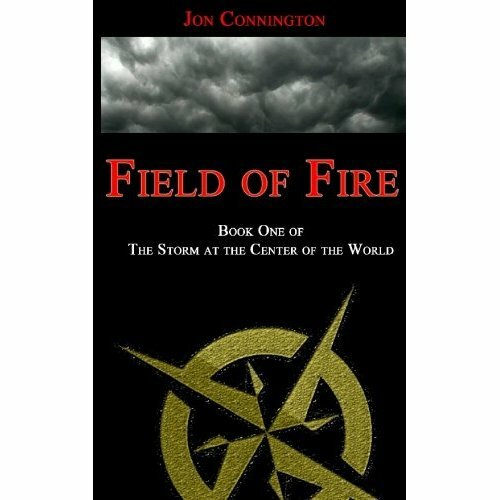 ANALYSIS: "Field of Fire" is set in a world where continents float in the sky at diverse levels and above the huge storm of the series title above, travel between is by flying wooden ships powered by sails and magic runes or by various flying animals that populate the sky, metal is rare and extremely precious - so weapons and tools are wooden or rock- there is quite a diversity of cultures, geographical settings, countries, political systems and faiths, populated by regular people, slavers, pirates, merchants, magicians and scientists. The novel is very entertaining, fast paced and full of action with quite a few twists and turns that are not obvious. Macsen's odyssey while not untypical of similar tales in various genres, reads very well since he is never the cliche, all knowing/destined hero, but just a youngster with a thirst for knowledge and the wide world who grows quickly under harsh circumstances and later is not afraid to take the chances offered by events. In addition to him there are quite a few fascinating supporting characters, from dastardly slave overseers and slave traders, to harsh masters, but also to brave companions. In the second thread featuring Zofera and which has a clear link with Macsen's one, we get to see a different view of the fascinating universe created by the author and we meet other interesting characters, while we understand something of the "big picture" and the reasons for the brutal events that open the novel. "Field of Fire" which as mentioned is independently published has quite a few typos, especially in the second half but the writing is good and very energetic, carrying the novel well, so personally I was not overtly bothered by them and the content of the book compensates for that in spades. A strong A and the potential for a great series if the sequels keep the pace, inventiveness and unpredictability of this one. Macsen dun Mocredd sounds like an interesting young man. "Field Of Fire" sounds like a great read. nice review, thanks.